Mrinalini Jasani Vogeler, ISH resident in 1956, currently lives in Bielefeld, Germany. Ila Jasani Good called ISH home from 1960-62. She currently lives in Virginia. In her senior year of college, Mrinalini Jasani left Calcutta (now Kolkata), India and traveled to Allentown, PA to attend Cedar Crest College. She stayed with family friends. The times and the people blessed her with the quintessential American experience. The small town offered a door into the real America, a complete immersion. “You must have the experience of a family and a home” insisted her host family. “There was no turning back once I entered the international arena,” adds Mrinalini. 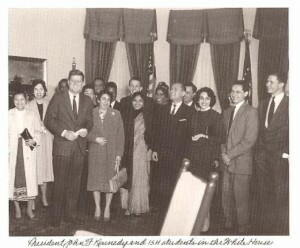 After her GWU program, she moved on to a job with the Indian Embassy. She spent a total of four years in Washington, DC. Her extended stay was unusual in that most ISH residents returned to their countries upon completing their studies. Despite being so far from India, Mrinalini (who became known as “Minnie” by Americans) explains, ISH became home because all of the residents were in the same situation – without family. “Together, we no longer felt isolated. ISH was secure and comforting. We became one big family.” She recalled that Mr. and Mrs. Baker, the director and his wife, were ever-caring and always available. The door was open – literally – no one even had to ring the doorbell. Society ladies invited them to their homes. “We were considered exotic birds.” An Admiral and his family invited Mrinalini to Martha’s Vineyard for a vacation, and hosted her and her friends on weekends in their DC home. Other families asked Minnie and I. House residents to housesit when they went on holiday. Thinking back, Mrinalini has a strong memory of the residents sitting on the iron staircase in the garden when a group photo was taken. “Is it still there?” she asks. She mentally walks through the House and settles in the informal reception area through the front door where everyone hung out. The staff was always there and residents could stop by and ask where anyone was. Like family. In addition, Mrinalini credits annual holiday letter from Anne Moore (whose now deceased husband Tom was the ISH director during Mrinalini’s time), with keeping her up-to-date with alumni news. Who needs Facebook? Ila Jasani became acquainted with the House thanks to her sister, Mrinalini. As an undergraduate at Smith College, Ila visited her sister and hung out with her friends at I. House. Smith was a very different experience than Georgetown University, where Ila attended graduate school – “. . . all girls, elitish and largely white. Coming to ISH exposed me to other types of people.” Unlike most residents, Ila stayed at the House for two years – the majority stayed only one year. The conversation moves from hobnobbing with VIPs to the more mundane daily life at ISH. The other ritual was the afternoon tea which was well-attended (graduate classes were at night). Neighbors dropped in and ISH staff and residents actively reached out to the neighborhood. Back row – right to left: Elizabeth from Liberia (went on to work at the UN), Paul Dempsey from Ireland (later became Irish Ambassador to India), a French Guinean national, and a student from Ethiopia barely visible.